Runner beans and French beans are used in many recipes and are easy to prepare. Fresh from the garden, they can be prepared, cooked and eaten within 30 mins. There is a better vegetable in the world than a runner bean that has just been picked from the garden. Prepared, cooked and eaten within 30 minutes! Along with Jersey Royal potatoes and English strawberries, runner beans are one of the highlights of the culinary year. Even if you only have a small garden you can grow them in large flower pots with the aid of long canes (about 8 feet tall). Water and feed them well and enjoy eating them! Wash the runner beans well and dry them on kitchen paper. Top and tail them. Young runner beans will not be stringy, but as they grow older and larger you will need to remove the stringy edges. Carefully run your knife along both edges of the runner bean to remove any unwanted stringy bits. Place the runner beans onto the chopping board and slice them diagonally into about 5cm strips. Put the runner beans into a colander, rewash and drain. The runner beans are now ready to go into a pan of lightly salted boiling water for 6-7 minutes. Easy as that! French beans are very easy to prepare. To eat them at their best you will want young pods about 4-6” (15cm) long. 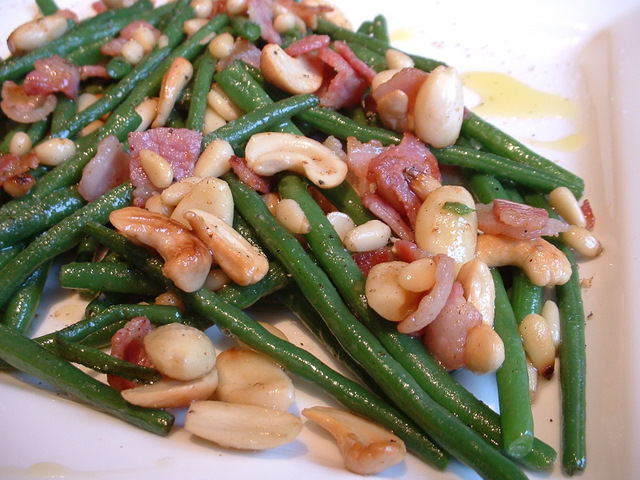 French beans go very well in many salads, either left whole or cut into smaller lengths. Leave the French beans whole. Take a small amount in your hand and hold them onto the chopping board. Using your cook’s knife, cut off the tops, turn the French beans around and cut off the tails. Try to keep the French beans all the same length. Place the French beans into a colander and rinse under cold water and the beans are ready to cook. Broad beans are a lovely vegetable and are twice as good if the tough skin is removed to leave the beautiful green bean. Here, we are using frozen baby broad beans, which freeze very well. Put a small saucepan of water on to boil. Add a little salt and then the broad beans. Boil gently for 2 to 3 minutes. Remove from the heat and drain the beans into a colander. Refresh them under cold water and allow them to drain well. Next, take a small knife and cut a split into one end of each bean. Then, using the thumb and first finger on your other hand, squeeze out the green bean into a clean bowl. It takes a little extra time to prepare the beans in this way, but it is well worth the effort.